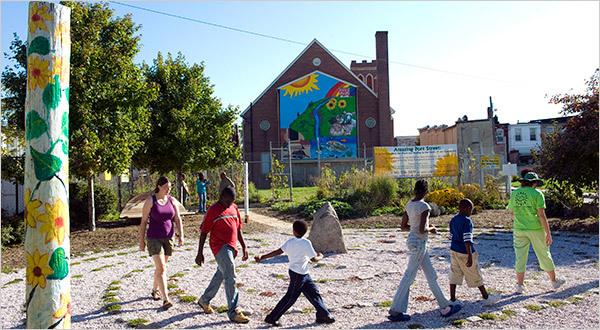 In 2004, Grants were made to two Baltimore City community gardening projects. The recipients are The Amazing Port Street Youth Initiative, and the Center for Poverty Solutions’ Edible School Yard Pilot. The Amazing Port Street Youth Initiative is located just a few blocks away from Johns Hopkins Hospital . This program organized ten young people ages 11-15 to participate in the project; leaning aspects of design, construction, growing plants from seed and plugs, nursery management and community service organizing. Residents in the community will receive the plants and be engaged in greening efforts in their neighborhoods. A new path was made at the Amazing Port Street Sacred Commons in east Baltimore, and abandoned houses near the Amazing Grace Lutheran Church were replaced by a labyrinth, a garden, and a wide-open grassy field. These were paid for with a grant from the TKF Foundation, run by Tom and Kitty Stoner. The Center is a statewide nonprofit with the mission of eradicating poverty by fostering opportunities that lead to self- sufficiency for people living in poverty. It has been operating its award winning School Pantry Program for 10 years and has recently received national recognition. The Edible School Yard pilot project in partnership with the Dr. Rayner Browne Elementary School with a student body of 174 children, located in the Patterson Park neighborhood of Baltimore City . Poverty Solutions will work with the school to weave this program into the student curriculum and formalize the learning process.